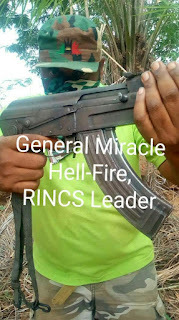 ENUGU - GENERAL Miracle Hellfire, leader of a revolutionary strike force, Revenge Incorporated, RINCS, has disclosed that the activities of the Anti-kidnapping agency of the Nigeria Police Force is far more deadlier and inhumane than that of the Special Anti-Robbery Squad, SARS, in the country. Gen. Hellfire who spoke exclusively to our correspondent on Monday, noted in particular that the Anti-kidnapping unit in Enugu state has become some sort of an abattoir where innocent people captured by the agency are slaughtered for money. He explained that some of these victims who are usually killed mostly at nights by the agency are butchered and sensitive parts of their bodies sold to desperate politicians in Nigeria, thereby making it impossible for the families of the victims to recover and bury the corpse of their deceased. He, therefore, warned citizens who have issues with the agency to rush to the courts to seek redress, saying that is the only way to prevent them from being killed by the blood-thirsty agency as they always persuade their captives against employing the services of a legal practitioner. “It’s quite unfortunate that the same evil and crimes against humanity we have witnessed in the SARS has taken a far deadlier dimension in the Anti-kidnapping agency, particularly in Enugu and other places where the politicians and the authorities that be are using the department to carry out various nefarious activities. “So many people who are innocent of any crime are being caught. The issue here now is that we have come to the knowledge that all that glitters outside is not gold. Our people are so naïve and myopic. Many of our people are ready to die protecting and preserving the seemingly right things, not knowing that most of the time, they’re being enslaved against their own will. Laws are made but how many people keep them? That is the issue. “Just like we found out what is happening at SARS, we also have discovered that the Anti-kidnapping agency flaunting as fighting against kidnappers and criminals are actually kidnappers themselves. They have been abducting innocent people, especially those returning late. “They carry their captives, knowing that by intimidation, they couldn’t be able to do anything except on some situation whereby the victim has personalities behind them as relatives or well-wishers. And when they capture and take them, they label them anything. A helpless person, who doesn’t know how to go about certain things, what can he do? He’ll resign to fate. “Many a time, these victims are slaughtered like goats, claiming they were criminals because they don’t know the law. Sometimes, they’re even subjected to a point where the victims themselves even believe that they are criminals because they don’t know the law. They not only torture their victims to agree or accept what they’re not, they’re still being killed and we just found out that when these people are killed or eliminated, they do not usually handover their dead bodies to their families who most of the time are unaware of what happened to their loved ones or where he or she has been. “Most of the time, the Anti-kidnapping agents take these dead bodies to their butchery, sometimes to outlets or in a cave, sometimes to Porsche houses where they have backyards. There, they cut and dissect the dead parts of their victims and sold to politicians and ritualists. This cannot continue to happen. One of such places is the Anti-kidnapping unit in Enugu, Port Harcourt, Abakaliki, Benin, Lagos, and Bayelsa,” Hellfire disclosed. He also painted a scenario of a recent incident in Bayelsa where agents of the Anti-kidnapping unit, unlawfully arrested a boy during the late hours and headed to an unknown destination outside the state. According to him, “In Bayelsa, a boy was picked up in the night. He only came to see off his cousin who was running late. As he was about to return, they(Anti-kidnapping squad) blocked him and began to interrogate him. The boy flashed his ID card and explained who he was. They collected the ID from him and slapped him. They dragged him to their hilux van and drove him outside Bayelsa. “It was when he saw the movement of these criminals, he now began to speak in his dialect, calling the gods of his land, saying if this is how he’s going to end, let it be known that he never committed any offence. One of the personnel who was the first that slapped him inquired where he came from. It turned out that the personnel that slapped him was just from a village, a stone throw from his own. “The personnel told the driver to stop. He told them that this boy has to go and explained that the village the boy came from is after his own and that the kind of power they have there, they’ll not escape if they look for this boy and didn’t find him. “Now, those who are not part of the system, what will they do? That is why I decided to let the world know, to let the quarters know because most of the people that claimed to be elders are still in the same cult system but let individual citizens know and realize that they have to defend themselves.